Lead a monthly discussion group and help your students understand the deeper experiences that they are already having. Inspire them to recognize their yoga experiences and carry them into their life. Facilitate their sharing of breakthroughs with each other and with you. Use this program to build and strengthen your yoga community. The relationships they establish in the discussion group will motivate their continuing commitment to classes and deepen their understanding of yoga’s application in their life. Begin teaching the profound principles of yoga philosophy — learning to listen and lead your students through meaningful dialogue. 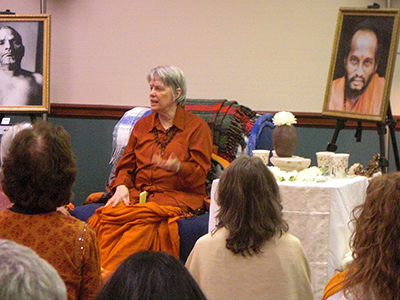 You will lead thought-provoking sessions using Swamiji’s theme articles as the jumping-off point. In this course, Swamiji trains you to prepare your program, moderate the group discussion, handle controversy and integrate your student’s understanding. You will be able to answer challenging questions with confidence, as well as redirect students to their own inner answers, encouraging the practice of self-inquiry as part of their continuing yoga experience. The conference phone calls are not recorded as live participation is essential. This phone course has four phone calls, with you completing homework in the month between the calls. Svaroopa® yoga jump-starts your inner evolution, leading to the discovery of who you really are. Grace begins the process, supports you along the way and completes your life’s purpose — the inner revelation of your own Svaroopa, your own Divine Beingness, your Self.